Update: Pure Tacos closed in May 2013. Not shocking. Pure Tacos is a new, 100% gluten free, fast casual taco joint at 20th and Chestnut. Kristy visited with a gluten free co-worker several weeks ago and said it was worth checking out for myself. The Philly location is an expansion of Pure Tacos' original namesake that debuted on the Ocean City boardwalk several years ago and received rave reviews. Kudos to Pure Tacos for striving to serve high quality, gluten-free food. We have several friends with gluten allergies and their hunt for quality food can be burdensome. Hopefully, more places pop up with a focus on gluten-free. Another to check out is The Quick Fixx at 15th and South, which has gluten-free pasta. To us, Pure Tacos was a small step above Chipotle, but far behind many of the taquerias you can find in South Philly. 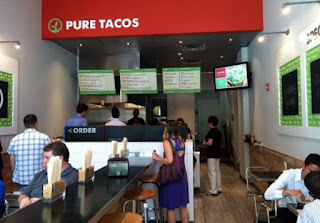 At Pure Tacos you can order two standard tacos for $6.48 or two premium tacos for $7.87. 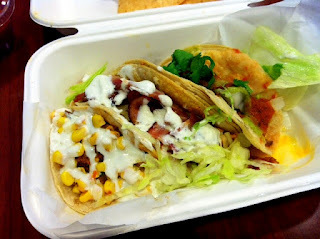 While the prices are not outrageous you can get three stuffed tacos for $6 at El Jarocho so it felt like we overpaid. I ordered two premium tacos - the hangar steak taco and the BBQ pulled pork. The hangar steak, recommended by the server, came with a citrus guacamole that went well with the steak. While the meat was tender it didn't seem particularly fresh, likely due to the Chipotle-style assembly line serving method. 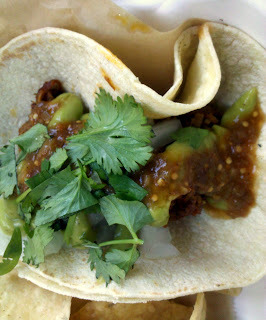 This was my favorite taco of the two, though. The pulled pork was a tad dry and again didn't seem fresh. 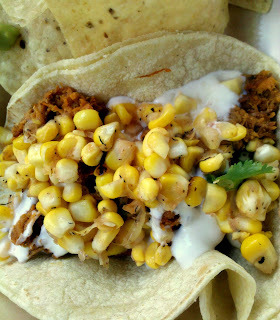 Toppings included corn, crema and small dose of barbecue sauce that didn't overtake the entire taco. It wasn't a bad taco, but I've made pulled pork countless times that was better. The gluten-free corn tortillas were comparable regular corn tortillas bought in a grocery store. Our gluten-free friends have commented that they weren't all that impressed with Pure Tacos corn shells compared to others they can eat. Kristy previously tried the chicken and bacon ranch, the beef brisket and the pulled pork as well. The first was, well, chicken, bacon and ranch flavored so if you like that combo, you'll like this taco. The brisket was her favorite of the three because its meat had the most flavor and best texture. It's made with chipotle seasoning, pickled jalapenos, cilantro, onion and citrus guacamole with a choice of salsa. She actually forgot to add the salsa and it tasted fine without it. She also tried the seasonal fruit guacamole and chips, which at $5.09 was a total ripoff for the small quantity provided. There are five guacamole options but we imagine none of them are worth the price based on serving size. Inside not much different than other mainstream taco joints. Kristy and her co-worker did find it really easy to order their tacos online and pick them up, though at the time there was no separate line for pickups, or at least no sign saying you could skip the main ordering line to pay and go. The tacos traveled fairly well about 15 minutes back to the office but are ultimately better off eaten inside the restaurant. Note that if you get chips to go they'll just be tossed on top of your tacos versus provided in a nice separate bag. This sounds like a harsh post, but it's not. I think I came away most disappointed with the Chipotle-style serving line. Why not do something different? Otherwise you're just like the big chains, only gluten free. I was also the only one there last Saturday mid-afternoon, so perhaps the experience and freshness increases during busier hours. 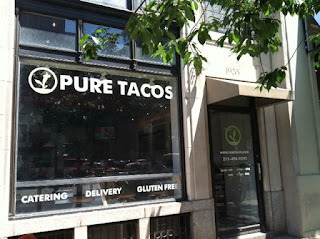 Overall, Pure Tacos would satisfy my needs if I'm in the mood for a quick bite and don't want to get on bike to head to a taqueria in South Philly. Plus the El Fuego at 21st and Chestnut is now closed so Pure Tacos is the only close take out option (we know of, that's not Chipotle or Qdoba). Neither of us expect to become regulars.